The region of Mars near the south polar cap called Planum Australe is made up of layers of glacial ice underneath a veneer of reddish dust. The coloured bars indicate an area where scientists working the Europe’s Mars Express spacecraft have probed the subsurface with radar and spotted a body of liquid water under the ice (dark blue patch). Where there is water, there could be life. For years, that hopeful thought has propelled mission after mission to Mars to follow the dry, sinuous channels carved by ancient rivers, analyze the chemistry of minerals deposited in long vanished pools and dig into the permafrost at the planet’s frigid northern plains. Now, for the first time, a team of European scientists is claiming evidence of a 20-kilometre-wide reservoir of water on Mars in the form of a saline lake – or possibly a giant mud puddle – buried deep under a glacier near the planet’s south pole. If confirmed, the discovery promises to re-invigorate efforts to detect life on Mars, and may ultimately reorient that quest toward the planet’s southern extremes. “There are bacterial species on Earth that can survive in a similar environment, so it’s tempting to conclude that this could be considered a habitat,” said Roberto Orosei, a researcher with Italy’s National Institute for Astrophysics in Bologna, who announced the finding at a news conference in Rome on Wednesday. The water’s location, beneath a 1.5-kilometre-thick layer cake of dust and ice, suggests that it might be as cold as -68 degrees C and kept liquid only by a highly concentrated blend of mineral salts. Dr. Orosei compared the find to that of two small lakes reported under a glacier on Canada’s Devon Island in the Arctic earlier this year. A key follow-up question for astrobiologists is whether the newfound reservoir is merely the first hint of a network of aquifers that could have offered hypothetical Martian microbes a harsh but stable environment over geologic time spans. “We need to know if it’s a unique occurrence or part of a larger system,” Dr. Orosei said. Dr. Orosei said the water must be in a liquid state to explain the signal he and his colleagues spotted in data gathered by Mars Express, a probe that was built and launched by the European Space Agency and that has been orbiting the planet since December, 2003. The probe includes a radar-mapping instrument that blasts Mars with pulses of radio energy, and then uses the reflected signal to reveal the planet’s structure and composition up to five kilometres below the visible surface. A key motivation for the instrument was the search for groundwater on Mars, long championed by its principal investigator, Giovanni Picardi, of the University of Rome. Despite fleeting hints that there might be something unusual near the south pole, the instrument found no conclusive evidence of water after several years. At that point, Dr. Picardi decided that too much information was being dumped in order to transmit the instrument’s data back to Earth through the spacecraft’s highly limited bandwidth. Together with his team, he devised a workaround by using a spare computer chip on the spacecraft that could temporarily store a more complete set of data and feed it back to Earth in dribs and drabs. The method worked, but it took three years to gather just 30 observations of the suspected area of interest, which could only be achieved when the spacecraft was passing directly overhead while at the shallowest point in its orbit, and when the south polar region was not illuminated by the sun. In trying to analyze the data, the team then faced numerous technical setbacks and false starts, as well as the death of Dr. Picardi in 2015 after a long illness. “We simply could not accept that it was over,” said Dr. Orosei, describing the team’s long effort to continue the project since then. Their results, published in the research journal Science, show that the spacecraft detected a strong radar reflection at a location about 81 degrees south latitude in a region known as Planum Australe, which they attribute to a sudden transition from solid ice to liquid water. While the reflection cannot reveal the depth of the water or water-soaked sediment, Dr. Orosei said that the liquid layer must be at least 80 centimetres deep or there would not have been such a strong signal. “To me it looks very plausible,” he said. Dr. Smith works with a radar instrument aboard NASA’s Mars Reconnaissance Orbiter, another probe that is circling the planet. However, that instrument employs a wavelength which cannot easily penetrate to the bottom of the ice deposits at the Martian south pole. Ultimately, he said, the only sure way to confirm the European team’s findings may be with a drill – a long-term undertaking that would require translating techniques developed on Earth to a Martian environment. Such an attempt would also raise serious questions about how to best explore a watery environment on Mars without risking contamination by Earth bacteria carried on drills and other instruments. The search for water on Mars dates back to 1974, after the Mariner 9 spacecraft sent back visual evidence of vast fluid flows that shaped the planet’s surface billions of years ago. Since then, evidence for past water has mounted. Excitement was further spurred by the 2011 discovery of thin veins of darkened soil found spilling down cliff sides and crater walls in many locations around the planet. Scientists have since debated whether the features are caused by water that may occasionally be reaching the surface even today. Gordon Osinski, a planetary scientist at Western University in London, Ont., is currently working on a concept study for the Canadian Space Agency for a radar system that could find water much closer to the surface than that discovered by the European team. 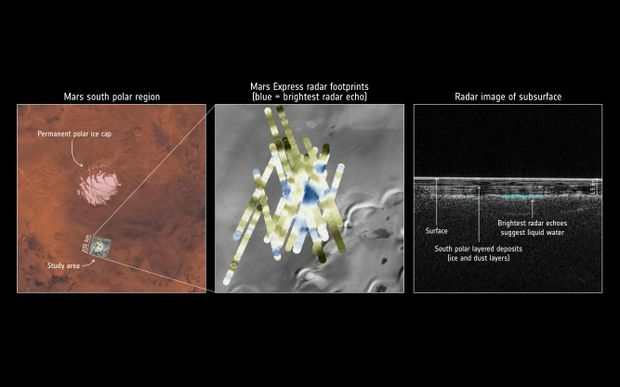 While the Canadian radar would mainly be looking for locations where ice could be accessed by future Mars explorers for life support and fuel, Dr. Osinski said the plan is also to target locations where it’s suspected that liquid water could be seeping out from greater depths.